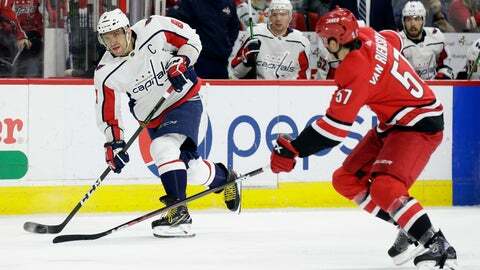 WASHINGTON (AP) — When the Carolina Hurricanes take the ice for Game 1 of their first-round series against the Capitals on Thursday, their blue line will have less playoff experience than top Washington defenseman John Carlson. Of their 342 games of NHL postseason experience, captain Justin Williams and second-line center Jordan Staal make up 213 of that; half of the Hurricanes’ lineup will be making their playoff debuts. Washington has two such newcomers and 1,282 games of experience, thanks to its Cup run a year ago and many previous playoff trips. The Hurricanes and Capitals are contrasts in almost every possible way. Carolina is a young, fast, aggressive team that ended a decade-long playoff drought. Washington is a seasoned group largely unchanged from winning it all in June and has its sights set on trying to do it again. The Capitals are in the playoffs for the 11th time in the past 12 years with Alex Ovechkin and Nicklas Backstrom. The last time the Hurricanes made it, coach Rod Brind’Amour was their captain and they were three years removed from their only championship. Williams is the tie that binds them after spending the 2015-16 and 2016-17 seasons with Washington before returning to Carolina. He was a linemate of Brind’Amour’s during the glory days and was part of Capitals teams that lost in the second round twice before breaking through after he left. Ovechkin is coming off his eighth career 50-goal season and was the playoff MVP last year, center Evgeny Kuznetsov was the leading scorer on that run and goaltender Braden Holtby was the Vezina Trophy winner in 2016. The Hurricanes match that with MVP-caliber center Sebastian Aho, Williams, Staal and overachieving goalies Petr Mrazek and Curtis McIlhenney who helped get them into the playoffs as the first wild card in the East. The Capitals are trying not to oversell their experience advantage and overlook the “Storm Surge” Hurricanes. The Capitals won all four meetings against the Hurricanes this season, two in late March, and outscored them 15-9. But these teams have never met in a playoff series, and the style of hockey changes so much that there might not be much to glean. Washington won’t have top-four defenseman Michal Kempny because of a lower-body injury. Carolina is without Calvin de Haan (upper body) for at least the start of the series. Reirden is starting with Carlson on his off side with fellow righty Nick Jensen and Dmitry Orlov with Matt Niskanen and Brooks Orpik with Christian Djoos. “We need to just step up, everyone on the D corps and help each other on the ice,” Orlov said. Former Capitals coach Barry Trotz was the first to put Kuznetsov up against opponents’ top lines, and the offensively minded Russian star embraced the challenge. Expect Kuznetsov’s line to be matched up against Aho, Williams and Nino Niederreiter, and the way he defends is by forcing opposing skill players to spend time in their own end. Aho will need plenty of help if the Hurricanes are going to knock off the defending champs. Rookie winger Andrei Svechnikov and big pending free agent winger Micheal Ferland are good candidates for that.